Motion Controllers have grown to be an integral part of the automation industry. These devices cater to a dynamic range of applications in multiple end-use industries around the globe. Motion controllers have witnessed significant growth during the past two decade owing to the increased dependence of industries on process and plant automation. Emerged as a dedicated unit for motion control, motion controllers have evolved to advance motion controllers integrated with PCs and PLCs (programmable logic controllers). Consequently, the adoption of motion controller is growing rapidly in applications ranging from point to point pick and place systems to sophisticated automation systems. The global motion controller market is anticipated to expand at a CAGR of 7.0% over the period between 2017 and 2025, rising from a valuation of US$1,641.5 mn in 2016 to US$3,013.0 mn by 2025. Based on type of axis, the global motion controller market has been segmented into multi axis, and single motion controller. Of these, the segment of multi axis motion controllers garnered the maximum revenue and volume in 2016, and is anticipated to expand at a significant CAGR over the report’s forecast period as well. The segment of single axis motion controller is anticipated to witness sluggish growth during the forecast period owing to requirement of additional or external power source of these devices. On the contrary, the multi axis motion controllers offer exceptionally low power consumption featured through the use of centralized power units. Based on product type, the global motion controller market is segmented into PLC-based, standalone motion controllers, and PC based motion controllers. Among the product type, the PLC-based motion controllers contributed largest market share towards the global market in terms of volume in 2016. However, the PC based motion controllers dominated the global market in terms revenue owing to high price of these controllers as compared to other product types. Furthermore, PLC based motion controllers are anticipated to expand at the most promising CAGR of 7.7% in terms of revenue during the forecast period. Based on end-use industry, the global motion controller market is segmented into aerospace and defense, automotive, semiconductor and electronics, metal and mining, food and beverages, healthcare, pharmaceuticals, plastic, rubber, and textile. Of these, the semiconductor and electronics sector held the dominant share in the market in 2016 and is estimated to expand at a healthy pace over the forecast period as well. Applications of motion controller in food and beverages, pharmaceutical, and healthcare industry are also anticipated to register high CAGRs from 2017 to 2025. The motion controller market has examined for five regions, namely North America, Europe, Asia Pacific, Middle East and Africa, and South America. Of these, the market in Asia Pacific acquired the dominant share of the market in 2016 and was followed by Europe. Collectively, the regions accounted for approximately 62% of the global market in the said year. The market in Asia Pacific is also projected to be the one with the most promising growth opportunities and is expected to outpace other regional markets in terms of CAGR over the report’s forecast period. Steady growth in end-use industries such as semiconductor, electronics, and food and beverages is expected to be the key driver for economic growth of this region, which is anticipated to fuel the growth of motion controller market during the forecast period. 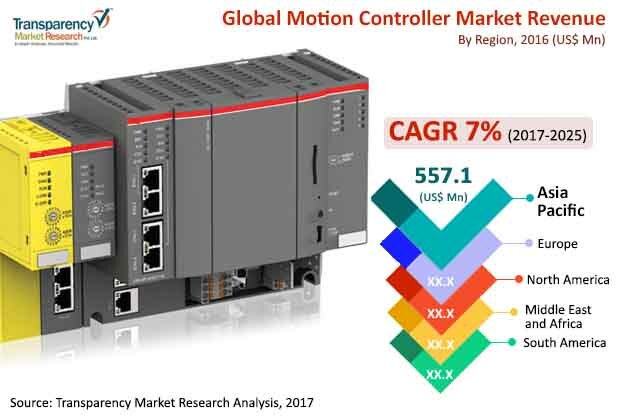 Some of the major players in the global motion controller market are ABB Ltd, Allied Motion Inc., Delta Electronics, Inc., Fuji electric, Mitsubishi Electric Corporation, National Instruments, Omron Corporation, Rockwell Automation Inc., Schneider electric, Siemens AG, Toshiba Corporation, YASKAWA Electric Corporation, and Yokogawa Electric Corporation. This report provides an analysis of the global motion controller market for the period from 2015 to 2025, wherein the period from 2017 to 2025 comprises the forecast period and 2016 is the base year. Data for 2015 is provided as historical information. The report covers all the major trends and technologies playing a major role in the growth of the motion controller market over the forecast period. It also highlights various drivers, restraints, and opportunities that are expected to influence the market’s growth during this period. The study provides a holistic perspective on the market’s growth in terms of revenue in US$ Million and in terms of volume in thousand units across different geographical regions namely North America, Europe, Asia Pacific, Middle East & Africa and South America. Global motion controller market is experiencing growth owing to the factors such as rising demand for plant automation to achieve greater equipment efficiency, increased throughput and optimized process accuracy. The global market is being dominated by Asia Pacific owing to prominent growth of several end-use industries in the developing economies such as India, China, and Taiwan. Moreover, Japan dominated the regional as well as global market in terms of both revenue and volume in 2016. Moreover, growing demand for Smart Factory fueled by Industry 4.0 in Europe and increasing foreign direct investments in Asia Pacific countries is anticipated to contribute towards the growth of global motion controller market. The market overview section of the report showcases the market dynamics and trends such as the drivers, restraints, and opportunities that influence the current nature and future status of this market. The report also provides the value chain analysis and key market indicators for the motion controller market. The motion controller market data estimates are the result of our in-depth secondary research, primary interviews and in-house expert panel reviews. These market estimates have been analyzed by taking into account the impact of different political, social, economic, technological, and legal factors along with the current market dynamics affecting the market growth. Motion controller market is segmented by type of axis, technology, product, end-use industry and region. By type of axis, motion controller market has been further classified into multi axis and single axis motion controller. On the basis of technology, motion controller market is segmented into general motion controller, and CNC motion controller. On the basis of product, the global motion controller market is further classified as PLC based, standalone and PC based motion controller. Based on end-use industry, motion controller market is segmented into aerospace and defense, automotive, semiconductor and electronics, metal and mining, food and beverages, healthcare, pharmaceuticals, and others (plastic and rubber, textile, etc.). Among these, semiconductors and electronics, and food and beverages are the key industries supplementing the growth of motion controller market around the globe. The report also includes competitive profiling of the key players associated with the motion controller market around the globe. The important business strategies adopted by them, their market positioning, financials, SWOT analysis, and recent developments have also been identified in the research report. The competitive landscape section of the report also gives an overview about the major contributing regions/countries by these key players in order to strengthen their market position in the future. Some of the major players in the global Motion Controller market are: ABB Ltd, Allied Motion Inc., Delta Electronics, Inc., Fuji electric, Mitsubishi Electric Corporation, National Instruments, Omron Corporation, Rockwell Automation Inc., Schneider electric, Siemens AG, Toshiba Corporation, YASKAWA Electric Corporation and Yokogawa Electric Corp.